My article 'Atsumori' is in the summer 2012 issue of Parabola. I have been reading Parabola since my college days, so I am very excited to be published in it. 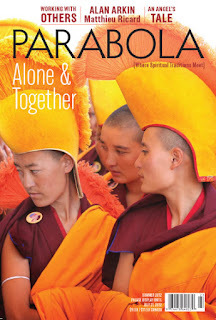 A few months back, when I saw that their summer 2012 issue would be on the theme ‘Alone/Together’, I thought of Zeami’s ‘Atsumori’, a Noh play about, among other things, mutual compassion, the actions of the individual when in a group, and the comfort of aloneness. My ‘retelling’ follows the original play as closely as possible. The layout of the piece is very beautiful and includes traditional woodblock prints of the Atsumori legend.